I love talking to other woodworkers and hearing how their journey in the craft started. I recently met Madison Swords, and I just loved his story of how he got started in woodworking, so I had to share it with you. Madison is a self-taught woodworker and he learned everything from YouTube. 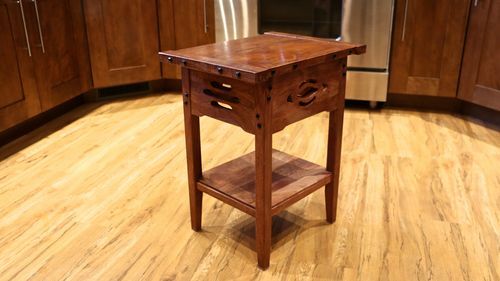 I was not only impressed with that, but the fact that he choose to go the hand tool route, and his for his first furniture project, he choose to tackle a Greene & Greene side table. I was absolutely blown away! In talking to Madison, it is clear he really gets it. He snaps up the knowledge and puts it to work straight-away in his own shop. He exhibits a wisdom and perspective beyond his years. I think his journey into woodworking is impressive, entertaining, and inspirational. Watch the interview with Madison Swords. Thank you, Madison… may the Gods be with you. Thanks Joe! Really encouraging and supportive words for both of us. I appreciate you watching. gr8 find in Madison, Todd. Thnx for that. He is a youngen with a very bright future. And to be 17 with a level head such as his, Wow!! Good luck in your woodworking future Mr. Swords. Outstanding table there Madison… Look forward to seeing more… Thanks Todd that was a great interview…. myself. The tools that were given to him by family made a nice start, but he took the next step on his own. Hope both of you keep having a lot of fun in your woodworking. this was so heartening, to see madison taking what is available , from his learning to his tools, i love seeing that woodworking is being kept alive, that our younger generations are learning it and madison is doing so well, his green green table is really beautiful and i have a feeling from his interview that he will do well, there are many good sources in his area to learn from, i would hope he would approach woodworkers like you todd and see if he can work with other woodworkers and learn as much as he can, thanks for the great video, i hope he does well, he should involve his cat and dog a bit more, they can add a good dimension to his work….lol…. Always great to see/hear a young woodworker coming into the fold. We need more young folks entering the craft. Seems like a good kid. And he has the coolest last name ever, so that’s also a plus. Great interview, as always! It’s nice to see that the next generation is carrying on the tradition! As someone posted, there’s hope for woodworking.